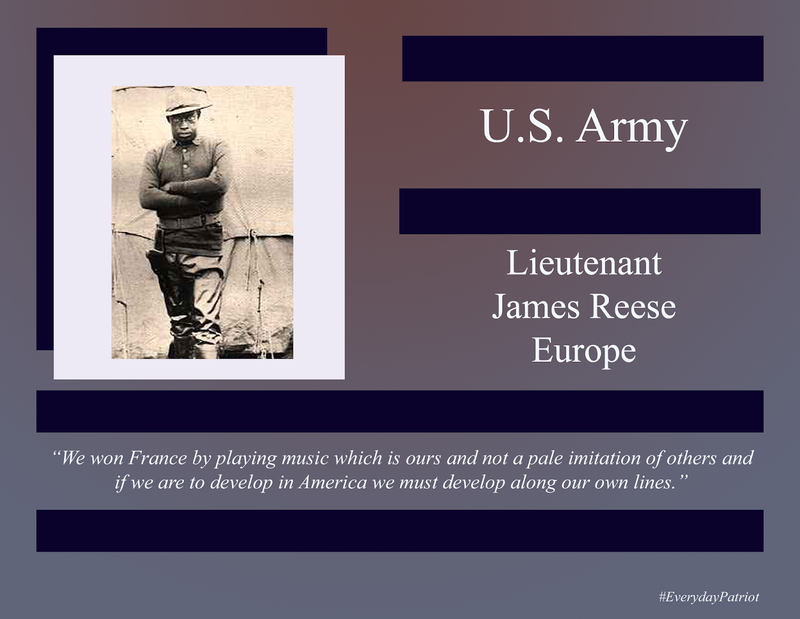 Lieutenant James Reese Europe was born on February 22, 1880, in Mobile Alabama before moving with his family first to D.C, in 1889 and then New York in 1904. A talented musician, he organized the Clef Club in 1910, which made history in 1912 by performing at Carnegie Hall in 1912. Staying active in the music scene, he established the Tempo Club and continued to perform, recording two albums in 1913 and 1914 for the Victor Talking Machine Company. During WWI, he was approached with forming a military band for the New York National Guard, which deployed as the 369th Infantry, who was known as the "Harlem Hellfighters", spent a whopping 191 days in the trenches during their deployment to France. They are also known for bringing Jazz to France as well, namely through the work of their regimental band. After returning to the states, he recorded for the Pathe Brothers and was again performing when on May 9, 1919, after a dispute with a drummer, Lieutenant James Reese Europe was stabbed to death. He rests in Arlington Cemetery.